Editor’s note: This review is part of our series on the top 10 smartphones released this year. The series was designed to explore how business users can be productive with these devices, and how they can take advantage of the devices’ features during the workday. This is part 3 of our review of the iPhone 6. 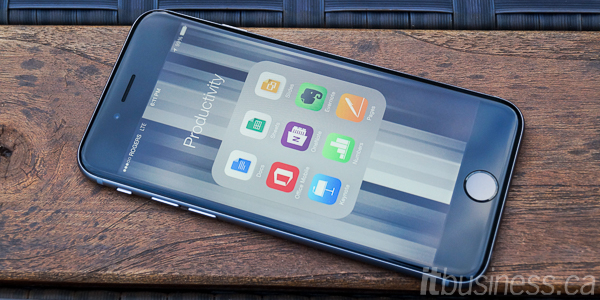 This section of the review focuses on the phone’s operating system, iOS 8. The iPhone 6 runs the latest version of Apple’s iOS operating system (OS), iOS 8. We tested the phone with the second minor update to it, iOS 8.0.2. But there is a good chance by the time you read this, the first major update, 8.1, will have been released. iOS 7 was quite a dramatic change from its predecessor, with a totally new visual style and a lot of new features. However, iOS 8 is more of an iterative upgrade. It is more about extending, refining, and opening up the features introduced in iOS 7. Note: one big new feature of iOS 8, the Apple Pay mobile payment system, is not available in Canada yet, so we are not going to cover it here. Like iOS 7 and every other Apple mobile OS prior, iOS 8 sticks with the familiar grid of app icons taking up residence on the home screen. That’s because at the end of the day, iOS is just a window into what is still the best mobile application ecosystem. Many of the of the third-party apps in the Apple App Store are simply the best versions of their type, often receiving new features well before the versions appearing on other platforms. However, in many ways, Apple’s OS does feel stuck in the past, compared to some of the advances on Android and even Windows Phone. Thankfully, in each successive update to iOS, Apple does seem to be adding (borrowing? stealing?) the best features from other OSes to bring iOS’ features level to its competition. For example, iOS 5 introduced the Notification Centre, similar to Android’s notification drawer, and each subsequent version of iOS has refined it. While iOS will probably never have Android-style widgets on the home screen, it does now have them in the Notification Centre. 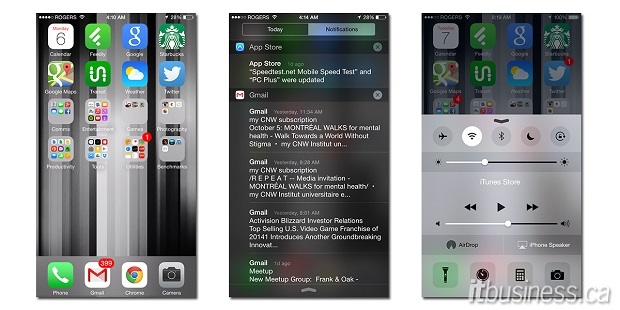 And for the first time in iOS 8, you can have third-party app widgets there too, such as one by Evernote. There is also a new actionable notification feature that allows you to reply to a notification, without having to go to the app. Apple’s overall OS philosophy is quite different than Google’s. While Android is an open OS and ecosystem available in many different flavours on a wide variety of hardware, iOS is a tightly controlled platform. Apple has restricted both users and developers from customizing their experience as they see fit – and while that can be frustrating for some users, iOS’ closed nature makes it a more secure platform, which is, of course, preferable for business use. Despite this, in iOS 8 it feels like Apple has softened its ‘my way or the highway’ software stance a little. We mentioned previously it has opened its Touch ID and camera APIs to third-party developers and is allowing third-party widgets in the Notification Centre. Now, it is even allowing third-party keyboards in iOS. In the middle screenshot below you can see the iOS 8 version of the popular Android keyboard app, SwiftKey. Apple’s native keyboard now supports predictive typing, displaying suggested words above the keyboard as you’re typing. Beyond the new and improved keyboard, another new feature on iOS 8 is an improved multi-tasking screen (shown in the first screenshot above) that also shows shortcuts to favourite contacts, as well as contacts users have recently called, at the top of the screen. iOS 8 also incorporates a new Health app that works with Apple’s new HealthKit service, allowing fitness device and app developers to integrate their data directly with Health. The last image above shows a unique software feature of the 6 and 6 Plus, where double tapping on the home button drops down whatever you are working on temporarily to make it easier to reach the top of the application. This is useful when using the iPhone in one hand, since being a taller device, it is a little harder to reach the top of the screen. Lastly, there is a new Handoff feature that allows you to share what you are working on with OS X Yosemite-powered devices. For example, you can start working on a document on your Mac, then seamlessly move to your iPhone and pick up where you left off. Still, despite all these upgrades, we do think the prime focus of Apple’s next major upgrade to iOS should be the notification system. While updates to iOS have gone a long way to improving things, the reliance on application icon badges on the homescreen to tell you which apps have waiting notifications is an outdated standby from earlier versions of iOS. We do not understand why Apple doesn’t just add an Android-style waiting notification count to the status bar. This would allow you to see at a glance what is awaiting your attention no matter where you are in the phone. iOS 8 is by no means perfect of course, and it is still early days for this new OS. While we did not have many issues, other users have reported that iOS 8 on the iPhone 6 seems to freeze and crash a little more than on older devices running it. However, we are pretty sure the upcoming update to 8.1 will deal with most of these lingering issues. Another problem is with applications scaling to the new higher-resolution screen of the 6. While the aspect ratio of the screen is still 16:9, giving apps enough space to fit, many of them are not optimized to take advantage of the 6’s higher resolution. For example, the iOS Gmail app initially did not look particularly good on the iPhone 6 until Google updated it a few weeks ago. From a business application standpoint, out of the box, the iPhone 6 does not come with anything more than the mail, contacts and calendar apps. The stock iOS Mail app is a very good email client, and for most business users using Microsoft Exchange, it works very well. However, if you want to use it with Gmail, there is one limitation, depending on whether you’re using a personal Gmail account or a Google Apps for Work account. If it is personal, you cannot get push Gmail in the iOS mail app, because Google stopped supporting it. However, Google Apps for Work emails can still get pushed to the iPhone, since the service needed is included in the monthly fee you pay Google. In iOS 8, Apple has added a number of features to Mail. There are new gestures that allow you to easily manage your email, so you can swipe left or right on a message to mark it read or unread, flag it, trash it or archive it. Unfortunately, the gestures are a little too sensitive. It is a little to easy to accidentally archive an email when all you were trying to was flag it. You can also designate a particular Mail thread as VIP, which groups VIP threads together, and you can use iOS’s VIP alert system to add a custom notification if there is any activity in that thread. From a productivity app standpoint, you have the freedom to use whatever business app ecosystem you choose, be it Office, Google Docs or Apple’s own iWork apps, Pages, Numbers and Keynote. Out of these apps, only Apple’s currently take advantage of the higher-resolution screen of the iPhone 6. However, we are sure Microsoft and Google will both update its iOS applications soon, making them more suited for the bigger screens of the 6 and 6 Plus. For other productivity and business applications, business users can tap into the broadest and best selection available on iOS 8. Apple’s mobile OS is the default choice for most developers, or it’s at least the first one they develop for. 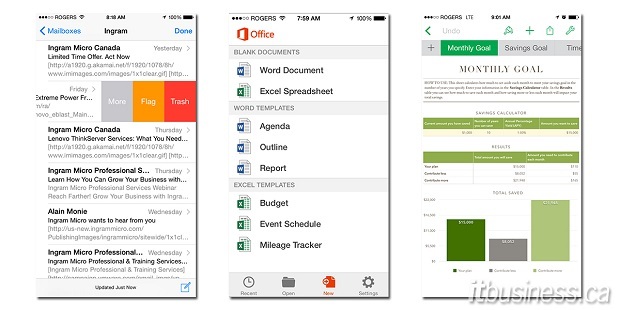 For example, Office came out for iOS well before it came out on Android. More recently, Salesforce Wave, Salesforce.com’s ‘analytics cloud, is launching on iOS first too. On the security and device management side, the iPhone has long been considered one of the most secure mobile platforms. That’s largely due to how iOS operates, as it places each application in its own sandbox. Apple also tightly controls every aspect of iOS, and you can only download and install apps from the official App Store, which Apple heavily polices. As previously mentioned, while the locked-down nature of iOS can often be frustrating to users, and does to some degree stifle innovation on the platform, it also makes it one of the most secure platforms out there. In iOS 8, Apple has added some new security and enterprise management features, such as better data protection and hardware encryption for important information on the phone.. iOS 8 also has a new always-on VPN feature, so users won’t have to reconnect every time they want to connect with their company’s network. Mobile device management (MDM) functionality has also been improved, giving IT administrators more control over the iOS devices they manage. For example, they’re now able to prevent users from wiping their phones. Enterprise mobility management (EMM) tools that enable these new MDM features on iOS 8 include AirWatch and MobileIron. 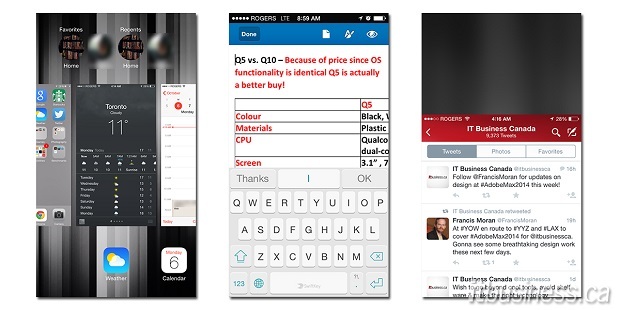 You can read more about AirWatch’s iOS 8 integration here, as well as MobileIron’s integration over here. There are also new tools to push iBook, ePub and PDF documents to users’ devices. With these tools, critical corporate documents can be pushed out to all users being managed, and they can be remotely removed when they are no longer needed. You can read more about the new enterprise features of iOS 8 on Apple’s website. With the inherent security of iOS’ design and the additional enterprise features Apple has added with each successive update to iOS, iPhones have replaced the BlackBerry to become the de facto business standard. The iPhone is now the preferred choice of smartphone for companies implementing a bring your own device (BYOD) or corporate-owned, personally enabled (COPE) mobile device strategy. However, its rivals have not been sitting still. Samsung Knox 2.0’s Enterprise Security and Management features, found on its latest hardware, surpass what is available in iOS. Apple does need to step up its game in this area, especially since Google has now licensed components of Knox and added them to the base functionality of the latest version of Android 5.0 (Lollipop). This means that all Android phones receiving this update will be much more manageable and secure for enterprise use. The iPhone 6 definitely ranks as being one of the best smartphones currently available for both business and personal use. On the hardware front, Apple has intelligently embraced the concept of a larger smartphone, but still kept intact the ideals that made the iPhone an iPhone. It is an impeccably crafted and powerful device with an almost near-perfect balance of features. We only perhaps wish that it was a little thicker, so as to accomodate a bigger battery. While the conservative changes to the core iOS experience means Apple is not likely to win over users who migrated to more open platforms, it has still added enough new features to placate those contemplating switching. Also, despite the fact iOS has fallen a little behind in some areas when compared to other mobile OSes, from an application ecosystem perspective, there is no comparison. For business users, if the best (or even only) version of an application needed to do your work is on iOS, then the iPhone 6 is really the only choice. For IT administrators, the iPhone 6 is also one of the most secure and manageable phones currently available. The iPhone 6 is available now in Canada from Bell, Fido, Koodo, MTS, Rogers, SaskTel, Tbaytel, Telus, Videotron and Virgin Mobile. Pricing is as follows (contract/no contract prices): 16 GB – $265/$750, 64 GB – $375/$860 and 128 GB – $485/$970. For part 1, which looks at the phone’s hardware and design, head on over here. To read part 2, which is all about the phone’s camera, jump here.